I think in the case of the Thomas range, traction tyres would be a good idea on some of the smaller locos, especially Emily with one driving wheel. Emily actually has two sets of driving wheels on her Bachmann model, mainly her actual drive wheels, and then the second set of wheels on the front pony truck are powered, same thing goes for the large scale model as well. The Walthers website has all the new Thomas products on it, does anyone know why they do but Bachmann doesn't? Chaz, would the permanent loads still be possible without the eye droppers? That is also a very cool modification. You could use something like a spoon if you do not have access to them, but why I would personally recommend eye droppers is because they are good for getting the alcohol/glue on every part of the load on the wagon, including the corners. Fortunately, I was able to pick up a pack of two eye-droppers for less than two dollars at Walgreen's (if you live in the US), which made things a lot easier. If I may add to your topic of the wagon loads, Chaz? I hope you won't mind. To add on to what Chaz had done with his wagon loads, it does provide some more weight to the "light" wagons. The methods used are common and there is another way that I'm working with are loads sculpted using white foam boards (the cheap stuff found at almost any home improvement store) and then the beads can either be painted stone grey for quarry loads or brush on regular white glue and put small gravel or coal onto the shaped foam. The trick is to make it temporary (if you'd like) so trimming is necessary to have the block fall into the wagon and plop out when you want it empty. It's very light weight too which has the advantage of having the Thomas & Friends locos go up gradients without struggling too much. The tools I used was a fine grit sanding block, a sharp knife (be careful!) and if you don't bite your finger nails, I sculpt the foam with my finger nails, a thin pin, needle or pencil. My apologies, Chaz if this may be stepping on your toes but hearing you speak about making wagon loads got me excited for sharing my work in progress as well. Also, I feel the more tutorials like this are very helpful for spreading the good word on adding wagon loads. Would you agree, good sir? No problem at all, part of the reason why I wanted those loads permanent on my wagons isn't so much because of weight, but it also helps when I take them out to shows for my club. It not only in some ways looks a lot better on the wagons, but it also reduces the chances of anything spilling out of the wagons whenever I have to constantly load or unload during shows. 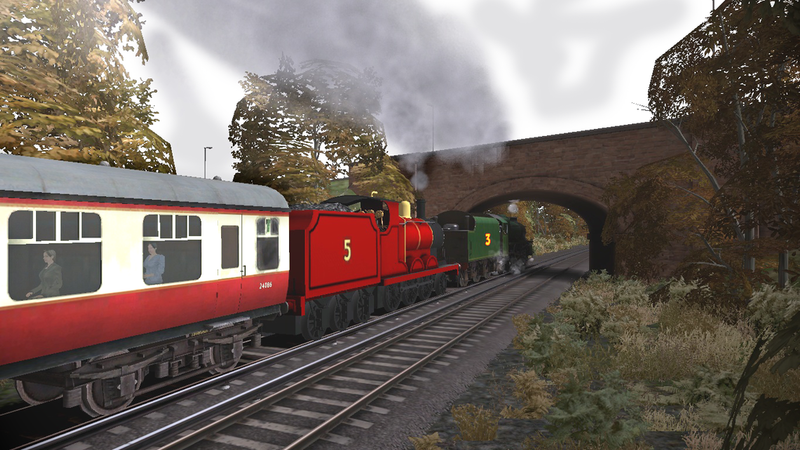 I was honestly hesitant on making the loads permanent at first, but when I tested the engines with the loads in the wagons, I saw that it really didn't make too much of a difference, if at all, when running. In some ways it was used as a personal convenience on my end but I am really happy hearing that a lot of people on here liked my loads. The foam method was brought up earlier too and I was thinking about using that for my hopper cars, but for the small Thomas wagons I figured it would be just fine without the foam since they are pretty small compared to the hoppers. The decision to make the loads permanent or temporary is anyone's call with their wagons at the end of the day, and that by itself goes along with the freedom of the hobby which in my opinion is one of the best things about the hobby of model trains alone. Speaking of Oliver, was he always numbered 1436 or was he originally a different number? Oliver would've originally been numbered as 4836, as what is now known as the Great Western Railway's 14XX/1400 class, was originally referred to as the 48XX/4800 class. The class retained their original numbering until 1945 when coal shortages on the Great Western Railway saw the trial of a conversion of 12 engines of the Churchward 2800 class into oil-burning locomotives. The experiment was encouraged by the government but abandoned in 1948, when the additional fees of imported oil and the conversion itself and other factors were calculated and it was worked out to be, in simple terms..."more trouble than it was worth" (a similar story to a handful of ex-LSWR T9 class locomotives that were converted to oil-burning). There's a store called Gotham Model Trains and it's on 32nd street I think. Look it up.